Red with a red dot below. All wording are imprinted. Each innner box contains 3 x ampoules in a plastics insert with keifei® on it. The outer box contains of 20 boxes x 3 ampoules in a white and red boxes. * Remarks: NEW PACKING WITH IMPROVE QUALITY AND QC CHECK UNDER USP STANDARD, KNOW AS KEIFEI PHARMA. catabolism. Nitrogen balance is improved only when there is sufficient intake of calories and protein. 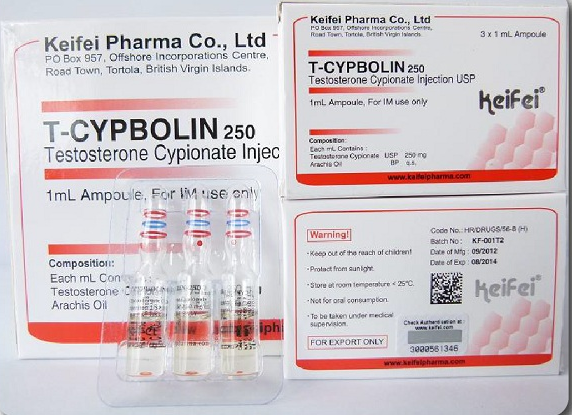 250 is also know as a long acting Testosterone which hold more water than T­ entbolin 300.